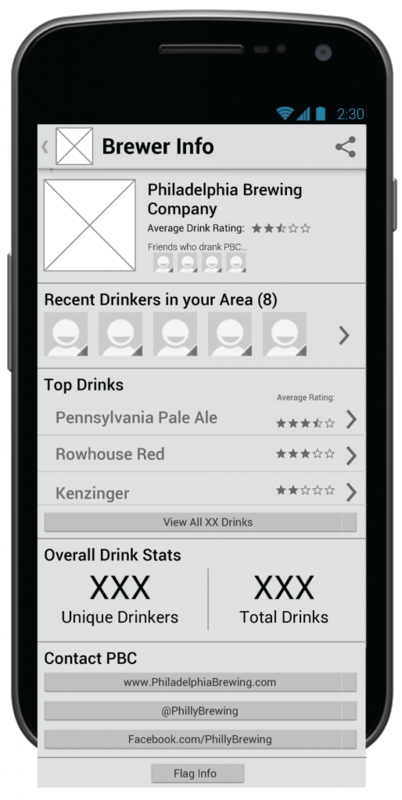 For my senior design project at Drexel, I worked with a small team of iSchool students to create a social-mobile application that allows users to check-in and share what they are drinking. As the team leader, I pitched this idea and we decided to pursue it into design and development. 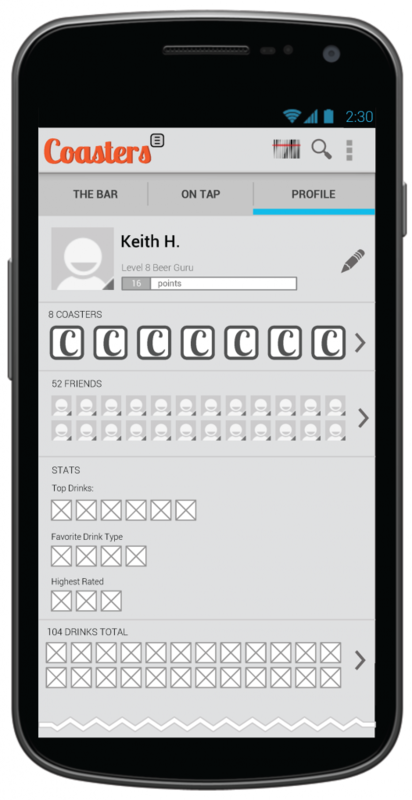 The Coasters app allows users to share what they are drinking with friends. Coasters uses a game mechanic to keep users enticed and allows them to earn virtual “Coasters” as achievements. 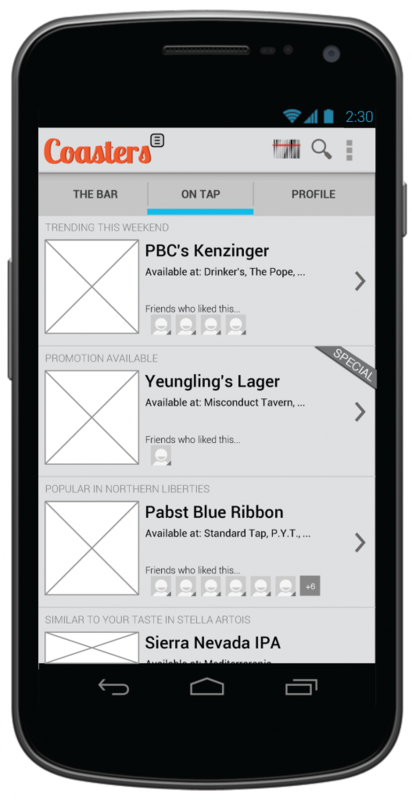 Targeting Android 4.0 (Ice Cream Sandwich), I created these wireframes using Android’s (then current) “Holo” design style, with the help of a team member, in OmniGraffle in order to show the key design tenants of the app before the development process began. 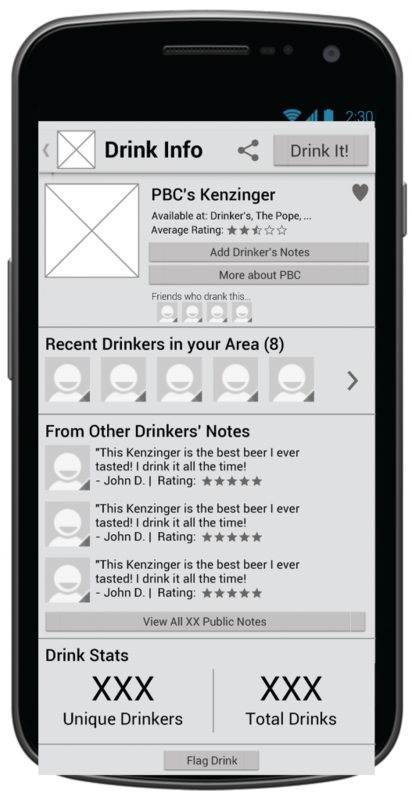 In order to limit the scope of this six-month project, we decided to reduce the primary function of the app to only allowing the user to check-in to different beers (as opposed to including mixed drinks, spirits, wine, soda, etc.). After going through a round of development, we decided as a team that developing the app on the Windows Phone platform would let us have a shorter development period, and a second set of wireframes was created. The iSchool Senior Design Challenge is an annual competition for outstanding iSchool senior project development groups, which showcases the integration and application of their undergraduate degree program into the final capstone sequence. Projects are team efforts and allow students to showcase the skills needed to work successfully on a team. The five teams with the highest qualifying scores are eligible to participate in the Final Event, where the Windows Phone version of Coasters was awarded an honorable mention. 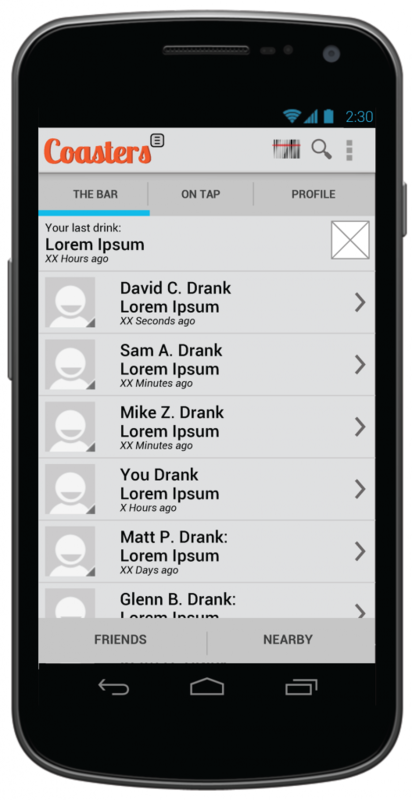 Example search screen where users can find drinks, vendors, and other users profiles. 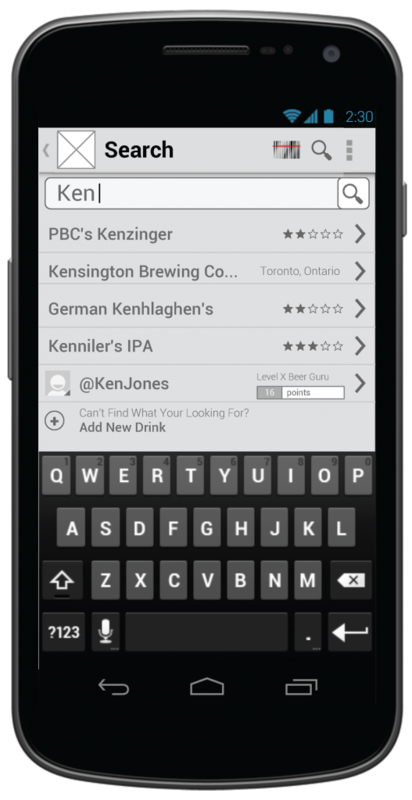 Users can also search for drinks by scanning a barcode by tapping the scan icon that appears throughout the app.